Rocky III – Did You See That One? Did You See That One? Who’s watching all these movies? Rocky Balboa (Stallone) has been on a dominating run as boxing’s heavyweight champion. With the support of his trainer (Meredith) and wife (Shire) he’s looking forward to retirement. 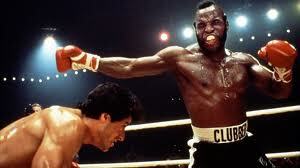 As his fans prepare to say goodbye, Clubber Lang (Mr. T) comes forward demanding his shot at the champ. 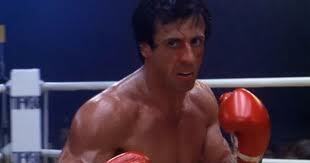 Despite his best judgement, Rocky takes the fight and soon realizes just how powerful this new opponent is. After a devastating loss he looks to his former rival Apollo Creed (Weathers) for the tools he needs to beat Lang. This 1982 film was a major box office success following the critical success of Rocky and Rocky II. This time Stallone was back in the title role alongside a familiar cast of characters. The cast includes Carl Weathers (Arrested Development), Talia Shire (The Godfather), Burt Young (Chinatown), and Burgess Meredith (Grumpy Old Men). The new face in this film is the familiar scowl of Mr. T who plays the powerful boxer Clubber Lang. The acting in this film has some good moments. Stallone, Shire, Young, and Meredith all do a nice job reprising their familiar roles. In addition, Carl Weathers does a nice job with a new take on his character. Mr. T also does a decent job with his role. His character is also one that I struggle with. The writing makes him feel like a comic book character at times. This is more the fault of the script than his performance. The script as a whole is good. At times the story does feel a bit cheesy but it’s not a fatal flaw and easily overcome with the flow of the story. Thankfully, the fight scenes are still nicely done and bring the true drama of the story to life. 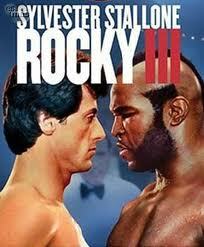 Overall, Rocky III is a good movie and a nice addition to the series. The acting is good, and the story is another fun adventure with Rocky Balboa. If you’re a fan of the other films I think this is one to watch. I give this one 3.5 out of 5 stars. Stay up to date with the most recent reviews!